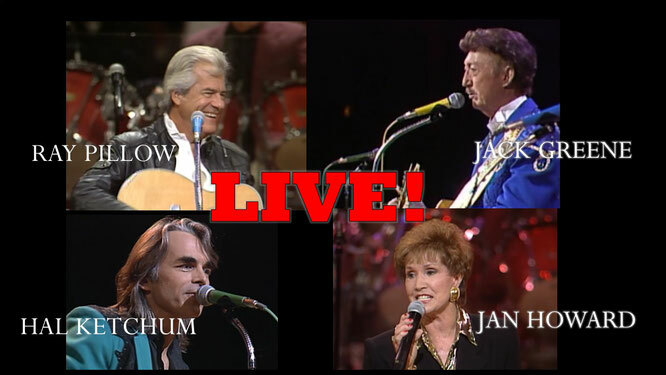 Ray Pillow, Hal Ketchum, Jack Greene, Jan Howard Live! Full Show! - Newhillbilly website. 100% American Roots Music. Ray Pillow (born July 4, 1937) is an American country music singer who has also worked as a music publisher and A&R representative. In his career, he has charted eighteen times on the Billboard country singles charts, with his highest-peaking song being the No. 9 "I'll Take the Dog," a duet with Jean Shepard. After charting for the last time in 1981, Pillow founded Sycamore Records with Larry McFadden, and later worked in the A&R department of Capitol Records. Through his record label, Pillow has released two albums, including Ray Pillow Live and his recent studio effort containing new material, Country Class. Both CDs can be purchased online through Pillow's official website and at his live shows. Jack Henry Greene (January 7, 1930 – March 14, 2013) was an American country musician. Nicknamed the "Jolly Greene Giant" due to his height and deep voice, Greene was a long time member of the Grand Ole Opry. A three-time Grammy Award nominee, Greene is best known for his 1966 hit, "There Goes My Everything". The song dominated the Country music charts for nearly two months in 1967 and earned Greene "Male Vocalist of the Year", "Single of the Year", "Album of the Year" and "Song of the Year" honors from the Country Music Association. Greene had a total of five No. 1 country hits and three others that reached the top ten. Billboard magazine named Greene one of the Top 100 "Most Played Artists." Lula Grace Johnson (born March 13, 1929), known professionally as Jan Howard, is an American country music singer and Grand Ole Opry star. She attained popular success as a country female vocalist during the 1960s and early 1970s and was twice nominated for the Best Female Country Vocal Performance Grammy award. Many of her hits were written by her husband at the time, Harlan Howard. The 500 Greatest Country Music Singles. In the late 1960s and early 1970s, she dueted with Bill Anderson on a number of top-10 hits, including the number-one hit "For Loving You".